A drive-by shooting attack in Kano on Sunday has left four people dead. According to Saharareporter sources, 4 people were killed today by suspected Boko Haram militants on a tricycle in Kano. Eyewitnesses told Saharareporters that the gunmen first struck at Dakata bus stop and then drove down and fatally shot two more people at Dakata Kawaji area opposite a graveyard near the Custom’s barrack in the area. One of the gunmen carrying an AK 47 assault rifle wore a dark blue kaftan according to one our sources. 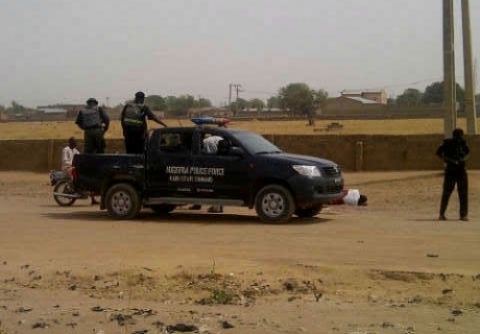 Policemen and Nigerian troops of JTF eventually arrived the scene about ten minutes after the gunmen had left to evacuate the people shot from the scene of the latest attack. Security remains tight in the city as Vice President Namadi Sambo is expected to visit the ancient city during the week. Is this the type of people the northern leaders want the federal govt to grant amnesty to? demons who work for satan, and kill for him should be granted unconditional amnesty? this most be a joke by the northern leaders. They think after creating boko haram to achieve their wicked aims of killing innocent citizens and destruction of property, they still expect that their children should be let go and at the same time be given moolah to settle them, perhabs to say thank you for the job well done? this is absurd. When u check d scenario, northern leaders are hiding under disgise the oda day dangerous weapon was found in one of d top politician house in kaduna yet they wanted fg 2grant their boys amnesty,they are all jokers in dis matter is only cowardise do hide under disgise this fire they ignited mst consume them one after d oder useles set of people. Buhari former president is boko haram. Don’t doubt me.